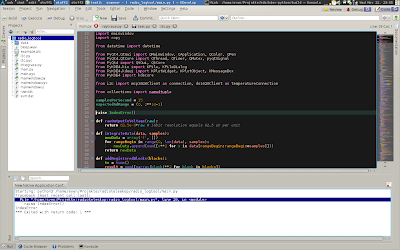 Linux, Games, Programming, and some other random stuff: kdev-python 1.4 stable released! I'm happy to announce the release of the first stable version of kdev-python, version 1.4! As this is the first stable release, this post is supposed to be an overview about what kdev-python actually does. There's also a few features other than static code analysis, such as debugger integration, but the former is clearly the main focus of the project. 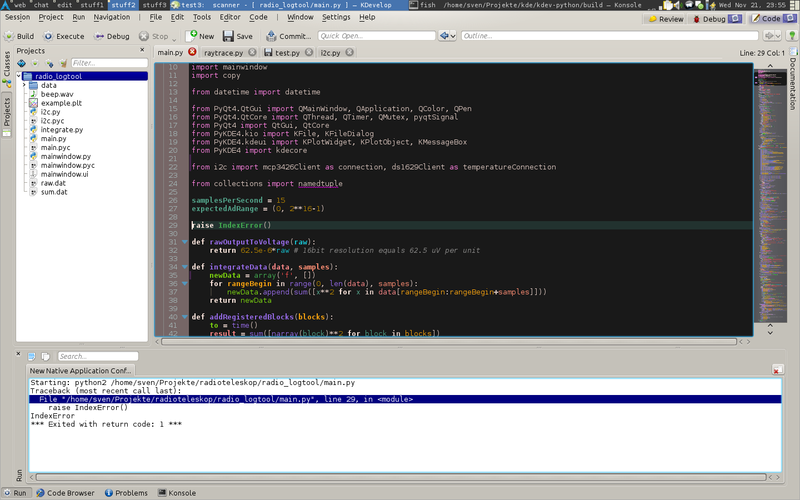 kdev-python itself is written in C++. The 1.4 release is only meant to be used with python 2.7. It does not depend on python 2.7, but scripts containing syntax which is incompatible with python 2.7, such as stuff new in python 3.x, will be marked as containing syntax errors. 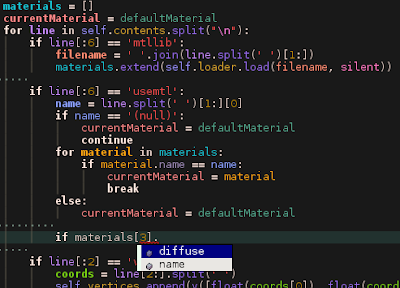 You can work around some things with __future__ imports, tough. A python 3.x version of the plugin is currently being developed; it's almost done, and will soon be merged to the master branch. The next release (1.5) will support python 3. Installing kdev-python 1.4 should be possible through your distribution's package management system soon-ish. The package will probably be called "kdev-python" or similar. The sources are available from here. Compilation instructions can be found in the tarball. If you want to open a whole python project, just click Project » Open/Import project, and select your project's root folder. ... and if it takes arguments, it's placed inside the brackets. For the "raise" statement, only names that will give a valid exception object are suggtested. Note that it is very difficult to get proper support for python libraries written in C. Currently, only a few select ones are supported. 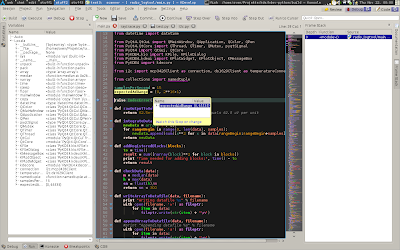 The support for PyQt4 / PyKDE4 is very good, as can be seen from the above screenshots; there's also some very basic support for numpy and a few others. Help is very welcome here, it's quite easy to get your favourite library supported (I think it can well be done in one afternoon without prior knowledge, and you can do it in just python probably). You can navigate inside the widget; all the blue things are clickable. You can for example click the "Material" in the first screenshot to look at the navigation widget for that class. You can also click the place of the object's declaration to jump there, or make KDevelop find all uses of an object. "Outline" does the same, but only in the current file. 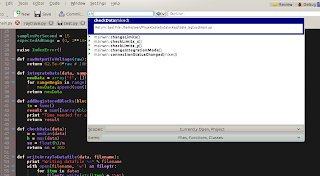 The navigation widget is replaced with the debugger widget, which displays the current value of the object your mouse is moved over. 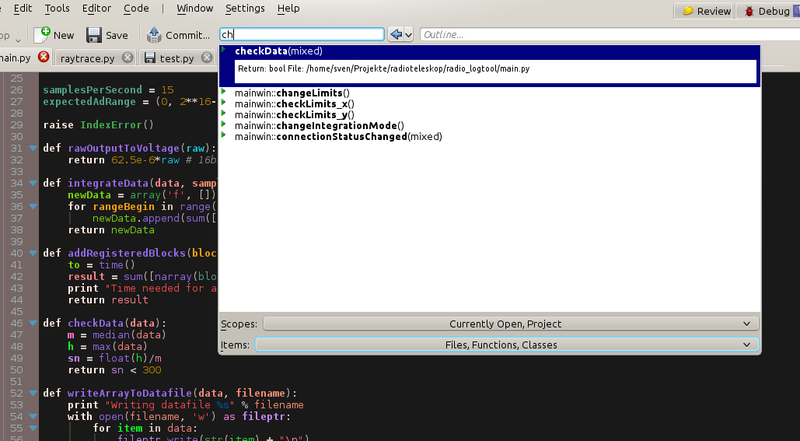 The left toolbar displays all current variables; you can exapand the trees to see properties of objects. 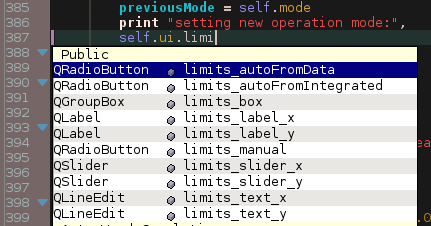 You can also enter some arbitrary python expression in the line edit in the bottom left and press enter; it will be evaluated on every debugger step and will be displayed there, too. 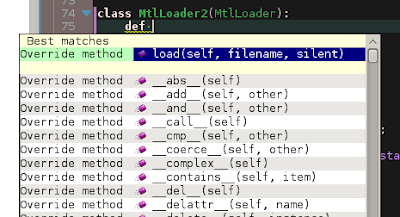 The right toolview shows a stack trace. Note that since this is based on a thin wrapper around pdb, threads are not supported (since they're not supported in pdb either). 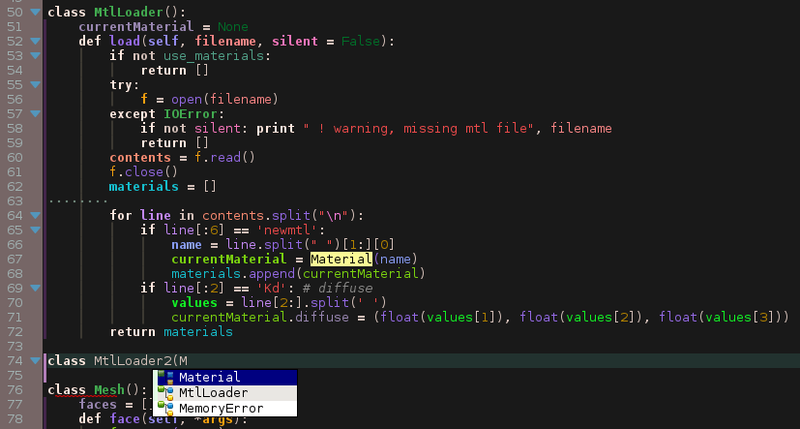 There is some special code to support debugging of Qt applications with event loops correctly. If you'd like to help this project, there's lots of things to be done! 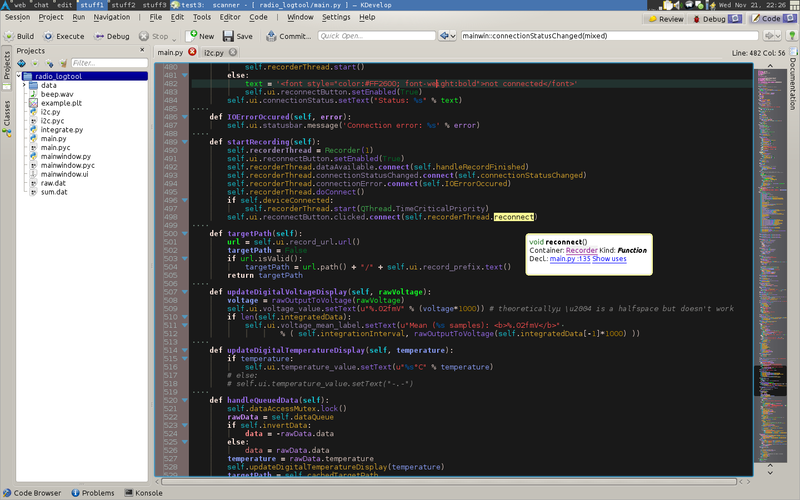 Just write me an email, or visit us in #kdevelop on irc.freenode.net. support for blenders internal python api would be awesome... How easy would it be to add this? That sounds good. The question is, tough, what information does it provide? Especially important for kdev-python would be "likely return type of a function", which is something most documentation generators don't have -- since it's not really well-defined for python in general (altough the return type is actually fixed for most functions). Of course you can in most cases not be sure what a function returns, but almost always there's only a few possibilities (for example "an etree.element instance or None on failure" -- but the function will never return, whatever, an int). kdev-python has a nice concept for those "unsure" types and they can be handled in a proper way. But you still need exactly that information ("what might be returned"). (And possibly virtualenvwrapper - which installs virtualenvs to ~/.virtualenvs ) ? There are problem with displaying non ascii docstrings - it's displaying like "???" Okay, thanks, I can reproduce that... I'll see to get it fixed in the next version. No -- in that case, only "/usr/local" is the prefix. That's what you told cmake with -DCMAKE_INSTALL_PREFIX, or rather, what it implicitly assumed if you didn't specify an install prefix. Heh, weird -- I was already wondering. You can reach me via jabber if you want, my address is scummos@jabber.org, or by mail. 1) Introspecion does by far not provide as much information as you want it to. It will, for example, never give you return types of functions, which are very important for this IDE (imagine lxml -- if the function parsing a string has no return type set, then you can forget the whole module, since your XML tree's root object has an unknown type and everything that is derived from that will have an unknown type too). It also often doesn't give you stuff like argument count, argument names, or proper docstrings. 2) Introspection is unsafe. Since on an "import", code from the library being loaded is executed, all this needs to be done in a good sandbox in order to not introduce horrible security flaws -- and sandboxing python isn't exactly an easy thing to do, as far as I can see. Argh blogger destroyed my reply text... I hate this software ._. I also hate that the world has in 40 years not invented a web browser which is capable of detecting that you spent time typing a text and saving it for you... well. 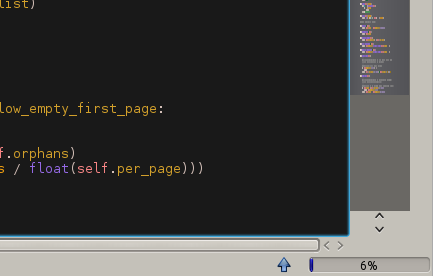 For python code, kdev-python has a somewhat sophisticated (~10k LOC) static language analyzer. The main purpose of that analyzer is to guess the type of each object in your project's python code as accurately as possible. Main sources of information for this analysis are of course variable initializations (myfoo = Foo() -> myfoo is of type Foo). The analyzer then tries to track this type as far as possible, through lists, tuples, assignments, loops,... and also function return types. So, yeah, the return type of a function type is determined from the types of the objects which appear in the return statements in that function. If you're willing to help, that would be very much appreciated -- this area is where you can really help this project much, because a) it's somewhat easy and b) it's likely to improve the usefulnes of the software by a large deal. 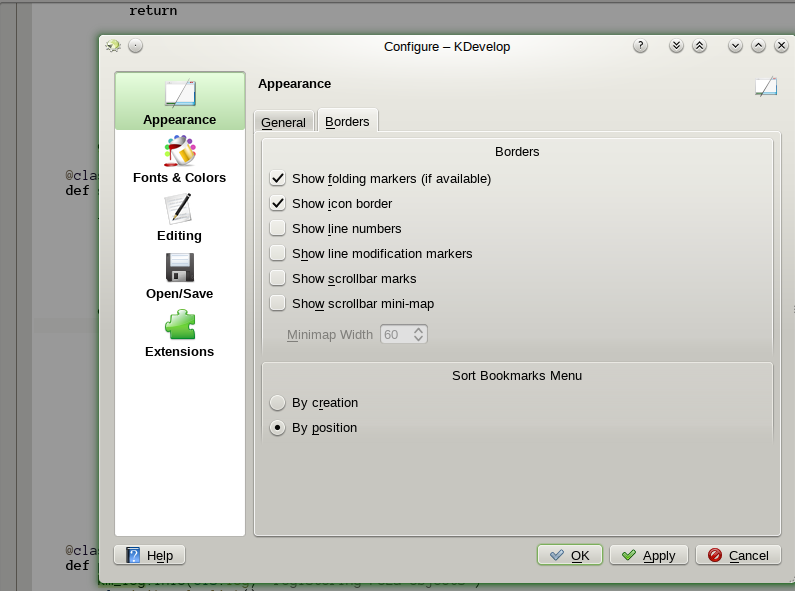 I'm using Kdevelop 4.4.1 (standard from Ubuntu 13.04). How can I hint kdevelop to look for the plugin /usr/local/...? Another question - I do not have code folding markers (triangles). Do I need to enable them somehow? Sorry, this is not the correct place to discuss the issue -- please report a bug with kate.